With improving internet speed and great availability of video content – more people are watching videos on the internet. Every video publisher is always looking for easy and free ways to get more subscribers, page views for their video content. While there are number of paid ways to get more eye balls for your videos, even simple free techniques can get you more people watching your online video content. Logo or subscribe button displayed on actual video will for sure get you more subscribers and viewers. Now Youtube has in-built features that allows you to add custom logo to all videos in few simple steps. Once you login into your Youtube account, click profile name and then click Settings option. Under “Channel Settings” on the left side, click on “InVideo Programming” option. 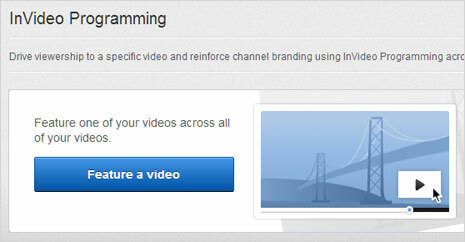 Then click “Feature you channel” button and continue further by selecting or uploading custom logo for your Youtube channel. Since logo is displayed every-time your videos are viewed, there is more visibility for your channel – specially for videos embedded on external websites. Everyone has one best video that is appreciated by many users. You can promote that specific ‘best’ video on all other videos in your Youtube channel. This can be easily done using “Feature a video” option in “InVideo Programming” feature section. 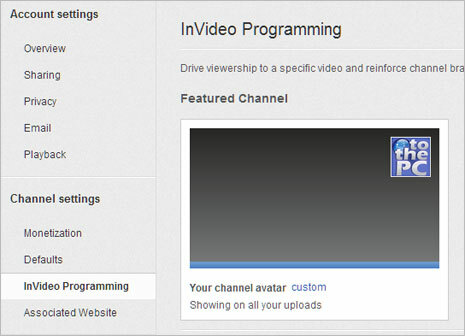 As explained in step 1, open “InVideo Programming” option and then click “Feature a video” button. Select the video or enter video URL that you want to feature on all other Youtube videos. This allows easy additional exposure to your best video content and get more subscribers. Setup dedicated social profiles on popular websites like Facebook, Twitter, Pinterest, Google Plus to promote your video content. Build network and connections on these social profiles and then start promoting your video content on them. Talk, tweet, post about your videos along with video URL – this for sure will send more users to your video page. Users often comment and send your private messages on Youtube channel. Do not ignore these, try to reply every received comment or message. This will start healthy interaction with other users and your channel will be most likely recommended by them to more users. Net effect of such effort is more subscribers and video views. Users coming from Google search and Youtube video search have multiply effect. They are more likely to subscribe and even share your videos on other platforms. So make sure your video content is optimized for search. Don’t just add title and then upload the video. Besides the title, add proper unique descriptive text on every video. Also include meaningful caption text, this for sure will give your videos better listing in search results. Remember: search engines do not understand the actual video, they only understand text that accompany your videos.